New Delhi: Confusion around the operations and working of Sri Lanka’s Mattala Rajapaksa airport refuses to end. Just days after the Civil Aviation Ministry told Parliament that India was not looking at controlling stake in the airport, the Ministry of External Affairs said New Delhi was considering a proposal for the same. On Thursday, MEA spokesperson Raveesh Kumar said that while it was premature to comment, the ministry was “currently exploring the opportunity to operate and manage…” He also highlighted that there were several bilateral projects related to infrastructure which was under discussion between India and Sri Lanka. There was an MoU, Kumar added, on economic projects that was signed during the visit of the Sri Lankan Prime Minister last year in April. “This is part of strengthening of connectivity in the region,” he said. Kumar’s statement came weeks after Sri Lankan civil aviation minister Nimal Siripala de Silva had told Lankan parliament that the country’s government had asked the Airports Authority of India (AAI) to submit its business plan to operate the loss-making Mattala Rajapaksa International Airport. Kumar said he was aware of the statement. However, De Silva’s Indian counterpart Jayant Sinha told Parliament two weeks ago that there was no proposal under consideration for the AAI to buy a controlling stake in the airport. Sinha also clarified that there were no plans for the AAI to build a flying school and a maintenance, repair and overhaul unit at the airport. The airport, dubbed the world’s loneliest, was built with high-interest commercial loans from China. The AAI is reported to have a 70 percent stake, while Sri Lanka’s CAA will invest 30 percent. The airport was officially inaugurated in March 2013 but the lone flight operating from there was also stopped in May this year due to losses. While it may have built the airport with Chinese money, the Sri Lankan government, under Maithripala Sirisena, has repeatedly said that the Chinese offer for operations was not great. The tug-of-war between India and China over Sri Lanka is a thing of the past but the fight for pole position has become visible. Sri Lanka is stuck in between, as was evident from cabinet spokesperson Rajitha Senaratne’s statement that Colombo was trying to balance the two countries. Mattala is barely 40 kilometres away from the Hambantota port, which China has leased for 99 years in lieu of the aid that it gave to Sri Lanka. 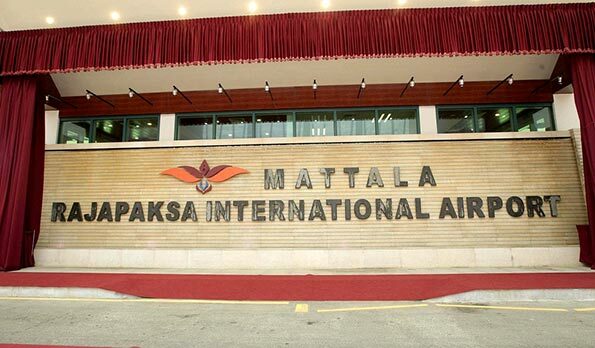 China’s interests in Mattala airport are obvious. It built the facility and ideally prefers having rights of operations to it too. There are also rumours doing the rounds that China wants to use the Hambantota port for military purposes. Enter India, which has had extremely strong naval ties with Sri Lanka. Additionally, it is no secret that India needs something to hold onto in the area. The airport could easily be the country’s eyes on China in Hambantota. Despite its strategic advantage, it is surprising to see the Indian government go on record to say it has no proposal to consider the airport. Chinese President Xi Jinping has also given a personal gift, approximately $200 million, to Sirisena and the Sri Lankan president has vowed to make houses in the south of the country with it. The geo-politics aside, the airport is a cause of concern for Sri Lankan domestic politics. The country has often been seen as one which has leased out, if not sold off, its assets to foreign countries. The 1987 Accord between India and Sri Lanka is still seen as one where the latter bowed in front of India, one of its strongest and oldest allies in the region. The sentiment has deepened with Sri Lanka throwing its weight behind China’s ambitious Belt and Road Initiative (BRI). Most of the loans from China came during the previous government under former president Mahinda Rajapaksa, who is still considered close to the Chinese establishment. Recently, Rajapaksa said his country’s decision to involve India in the Mattala airport project would “unnecessarily” embroil Sri Lanka in the power tussle between India and China. Finally, it looks like SL will manage to initiate a conflict between India and China. But even before the conflict start, it will the spineless ant goes around the world with the begging bowl going to perish!! !